What should I know before moving to a new data center or colocation facility? What are open-source data center management tools, and how will I know if they’re right for me? How can data and analytics help me manage and monitor my data center more effectively? These are just some of the questions that our own James Cerwinski, Director of Product Marketing, will be addressing during panel discussions next week at Data Center World in New Orleans, Louisiana (DCW NOLA). Prior to DCW NOLA, we caught up with James to get his thoughts on what works (and what doesn’t) in managing a data center or colocation move, little-known information about open-source DCIM tools, and what the future holds for DCIM and data center management. 1. In your experience, what tends to work well in ensuring that your data center or colocation move is a success? JC: A phased approach is critical to ensuring a successful data center move. In other words, start small and simple and expand over time so you can focus on your most critical business challenges first and minimize the negative impact of change. Once you’ve established success, you can expand on the initial project. And when you’re in the planning phase, make sure to be clear on what you are moving and to include all relevant stakeholders. It’s also important to know how you will be measuring the success of your data center move. Tip: Looking for more information on how DCIM can simplify your colocation move? Download our eBook: Using DCIM to Help Plan a Data Center Move to a Colocation Facility. 2. What are some things most people may not know about open-source DCIM tools? JC: When you’re on a budget, open-source DCIM tools can seem like a really attractive, free option, but only if you’re a certain type of user. Most open-source DCIM tools are aimed at developers with some coding experience, so it might be difficult for your average data center manager or operator to quickly get up and running. If being able to import large amounts of data is important to you, you might be surprised to find that many open-source DCIM tools won’t let you bulk import out of the box. And connecting to CMDB or other systems can be cumbersome with limited API support for integration. Among others, these are important considerations before you decide if open-source DCIM tools are right for you. 3. What are some ways that DCIM solutions are incorporating predictive analysis? JC: The ease of being able to analyze your data is a key differentiator between a using a DCIM solution versus spreadsheets to manage your data center. Most DCIM dashboards have trend charts to help you know when you will run out of power capacity, which minimizes potential downtime and disruption to critical business operations. Many DCIM solutions also allow you to investigate “what if” scenarios: If you make a change, what impact will it have? And there’s one in particular that most people don’t realize they need until they see it: the failover scenario, which simulates failover conditions and provides information about resource availability in case of failure—without actually affecting the equipment. Want to hear more from James? 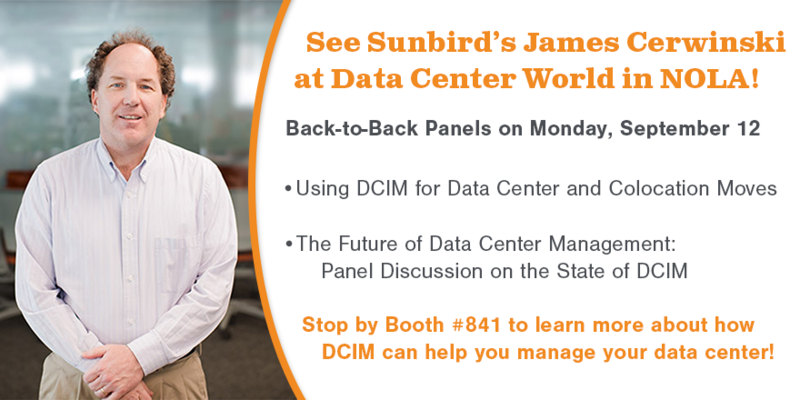 Catch him on back-to-back panel discussions at Data Center World on Monday, September 12, 2016: Using DCIM for Data Center and Colocation Moves (Room R206; 1:00-2:00 PM) and The Future of Data Center Management: Panel Discussion on the State of DCIM (Room R206; 2:10-3:10 PM). And don’t forget to stop by Booth #841 in the exhibit hall for a taste of features to come in the next version of our award-winning Data Center Infrastructure Management (DCIM) solution. When you visit, don't forget to drop your DCW NOLA Raffle ticket in our fishbowl for a chance to win a GoPro Action Camera.